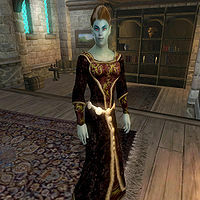 Dovesi Dran, a Dunmer commoner, is a guest at Summitmist Manor in Skingrad. She is killed for the Dark Brotherhood along with other guests in the Manor. She is attracted to Primo Antonius, though the others think she just likes him for his wealth. She doesn't like Matilde Petit, rightly thinking her to be racist. She wears upper-class attire consisting of a black & burgundy outfit and a pair of gold trimmed shoes and carries a few gold coins. Dovesi knows a leveled set of witch's spells as well as extra Destruction and Mysticism spells. This page was last modified on 25 March 2018, at 02:48.